This is a haunting poem from the 15th century, a time when the 'Dance of Death' and other memento mori themes were becoming increasingly popular. I almost feel I should apologise for its gruesome nature, but as poetry, it's incredibly effective, mostly because of the rhyme scheme (a single rhyme per stanza) and the obsessive repetition of 'earth', which gives it a kind of spooky incantational sound. Alexander died, Alexander was buried, Alexander returneth into dust; the dust is earth; of earth we make loam; and why of that loam, whereto he was converted, might they not stop a beer-barrel? 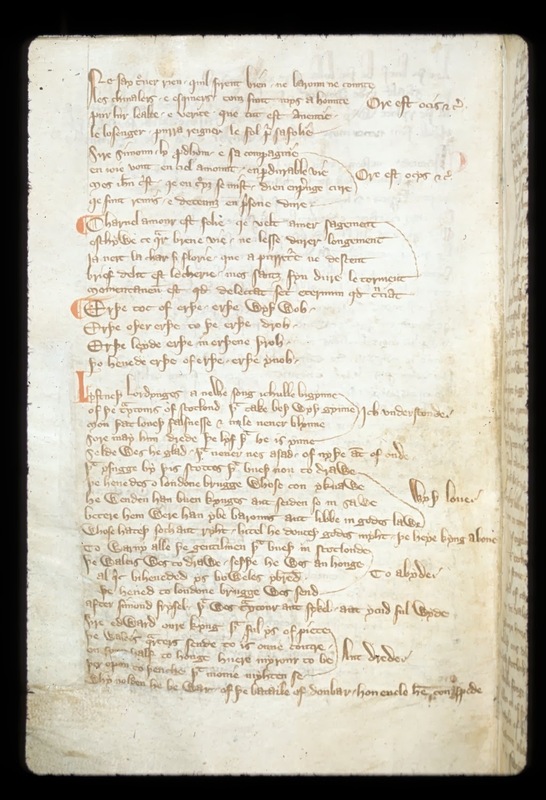 Here's the medieval poem, with a modernised version below (of the many available versions, this is the text of Lincoln, Lincoln Cathedral Library MS. 91). Essentially, to read it you have to understand every first earth as 'man (who is dust)' and every second earth as either 'earth' (as in, 'the world') or 'dust', in the sense of physical matter; but the point of the poem is that they are the same thing. Thane sayse erthe unto erthe, "This es al ourres"
Thane shall erthe for erthe suffere sharpe scourres. Thane shall erthe of erthe have a foul stinke. How that earth upon earth may be high brought. Then shall earth of earth have full hard parting. Then says earth unto earth, "This is all ours!" And yet shall earth unto earth go faster than he would. Then shall earth of earth have a foul stink. Thank you for this. I have a friend who just went to prison, and one of the first things he asked me for was a copy of "Erthe upon Erthe." He wants to consult it as he puts the finishing touches on his nigh-epic poem about St. Guthlac. In my research I came upon your blog by way of this post. I am enjoying it so much. My friend would enjoy it too. I think I will be having to print many of your posts to send to him, since he has no internet access where he is. Wow, an epic poem about St Guthlac - what an admirable undertaking! Thank you for commenting and telling me about your friend - I'm glad you have found my posts helpful and I hope he will too. Hi, is there any music, a particular melody assotiated with Erthe upon Erthe poem? Not as far as I know, I'm afraid! The Medæival Bæbes have put it to music if you want a musical version, though the tune isn't "authentic" so to speak. Staines Morris, and "that mayde Mary"